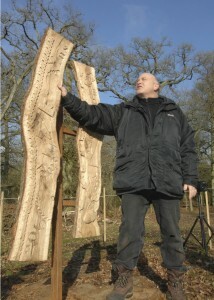 Simon Clements with the OneOak sculpture. Photo Angus Beaton. Sculptor Simon Clements has talked about the inspiration behind the OneOak sculpture, unveiled at the Blenheim Estate in January 2010. 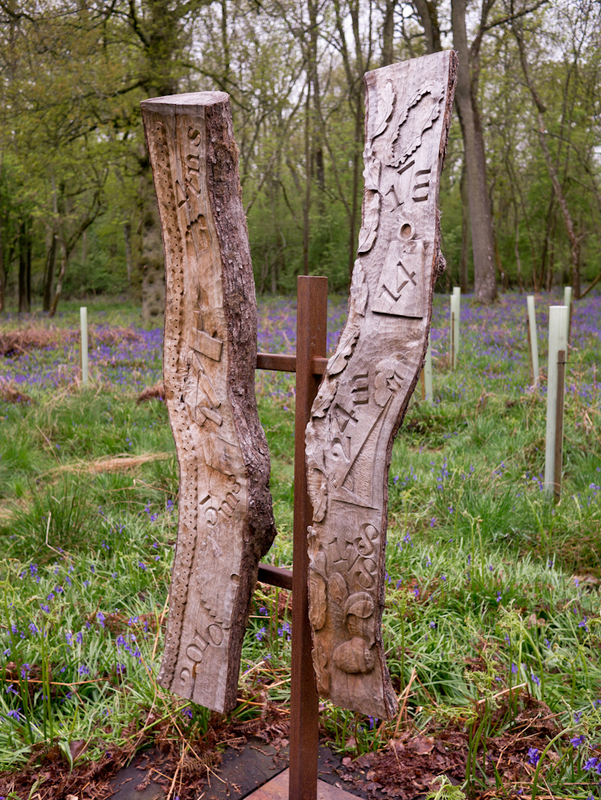 “After the OneOak tree was felled in 2010 I wanted to create a memorial, sited where it had grown for 222 years. I took as my inspiration decaying churchyard stones, ancient weathered timbers, and age worn lettering. I decided that the memorial should be enigmatic: I imagine a curious passer by stumbling across a moss covered carving, weathered with age and wondering why it was there. In the same way that plaques attached to the voyager space probes carried a scientific description of our species and our planet, I wanted my carving to describe a little about the tree and how we have made use of it. 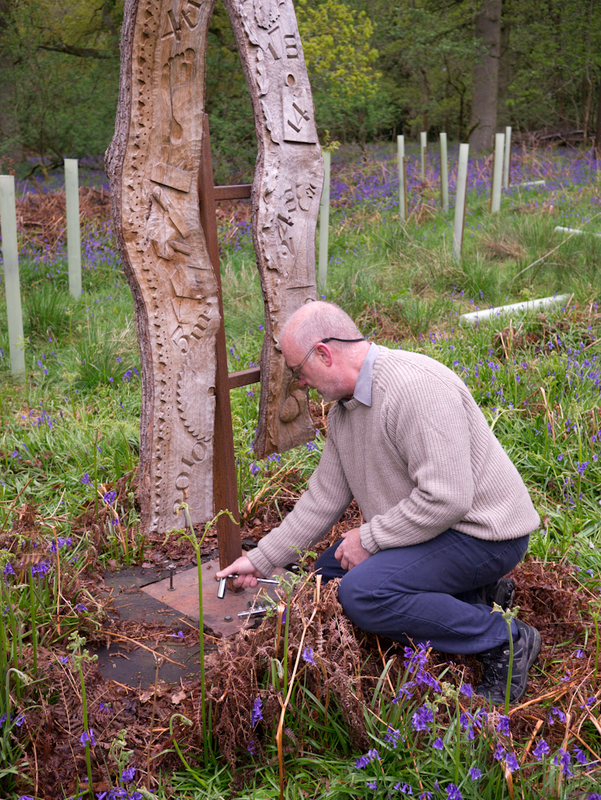 Simon’s sculpture is currently sited on the base of the OneOak tree in the woodland at Blenheim. It will be removed temporarily so that it can be displayed at the various OneOak exhibitions that are planned for 2011 and 2012. The first of these will be at the University of Oxford Botanic Garden from April. For the second year running we are taking the OneOak exhibition to Art in Action; one the UK’s major art shows. 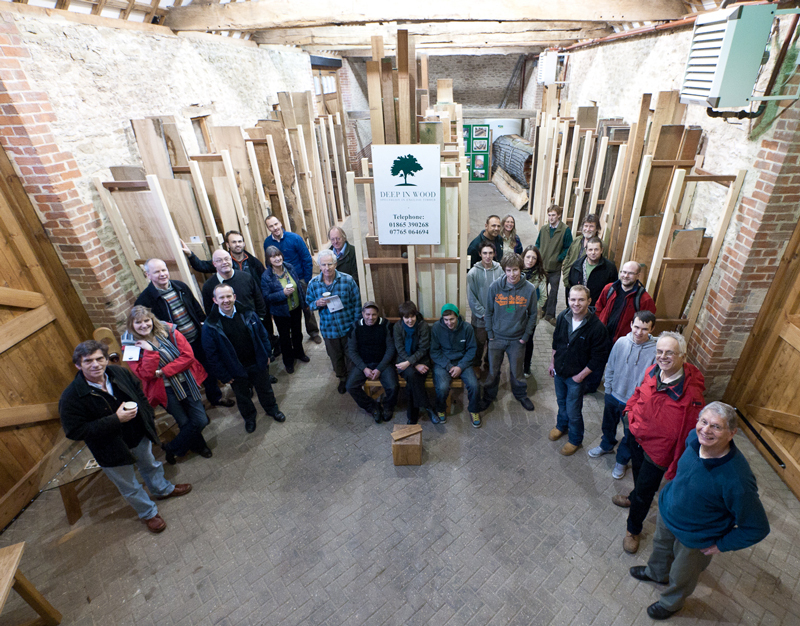 This year we are delighted to have some of our makers and collaborators alongside us in the Woodworking area. These include Richard Fox sculptor, Rodas Irving green furniture maker, Martin Damen green woodworker, Rycotewood Furniture Centre, Living Woods magazine, DZ Design and Simon Clements. We will be showing several of our films, displaying some of the inspiring original works of art, and have several large pieces that have been already been made from the OneOak tree. 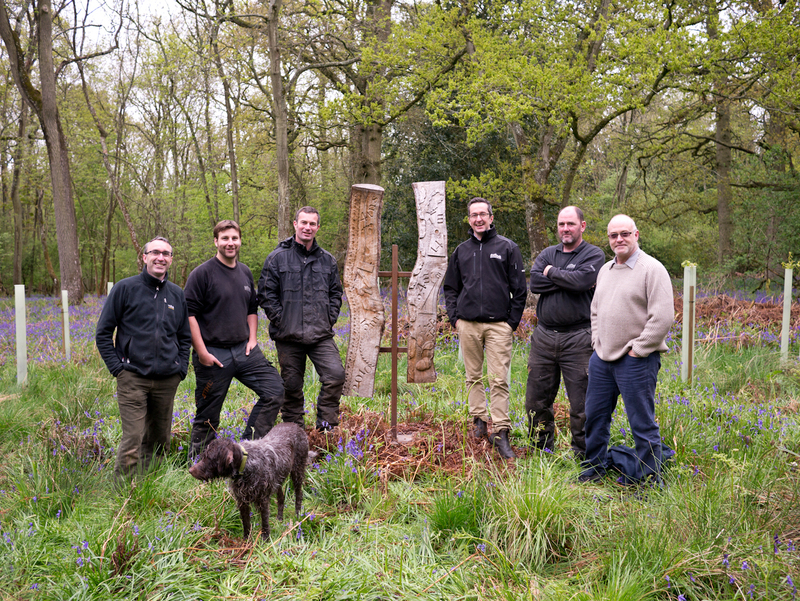 We will display the memorial sculpture made by Simon Clements, a spider bench made by Ian Smith of Rycotewood, and we will display the first length of timber and the 22 boards from the tree in the form that it’s been dried at the sawmill. For the first time we are also selling limited edition prints of some of the artwork. 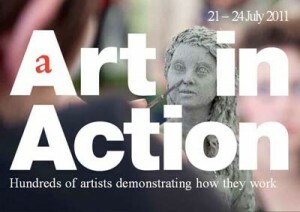 Art in Action is on between Thursday 21st and Sunday 24th July – we hope to see you there. 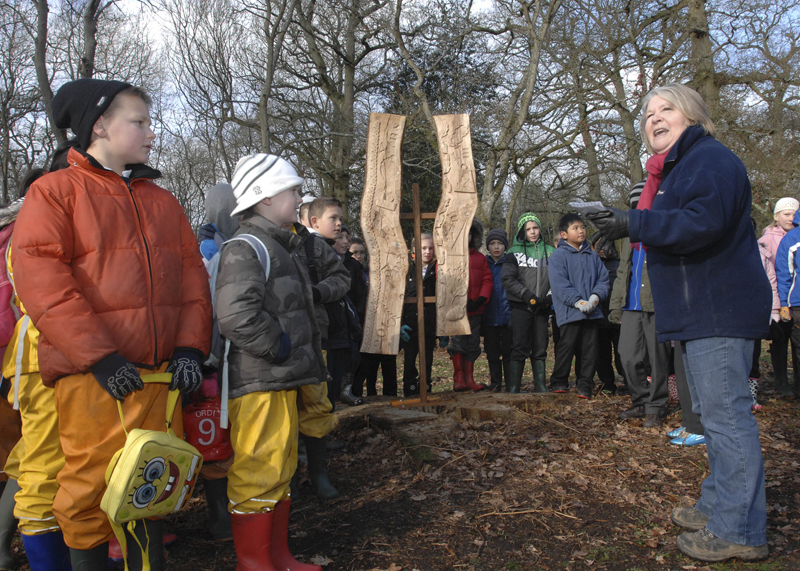 One hundred guests, including children from our partner primary schools, returned to the site where the OneOak tree was felled one year ago. 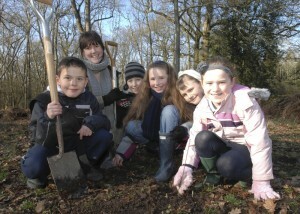 They came to celebrate the life of the OneOak tree and to plant a new generation of oak trees. 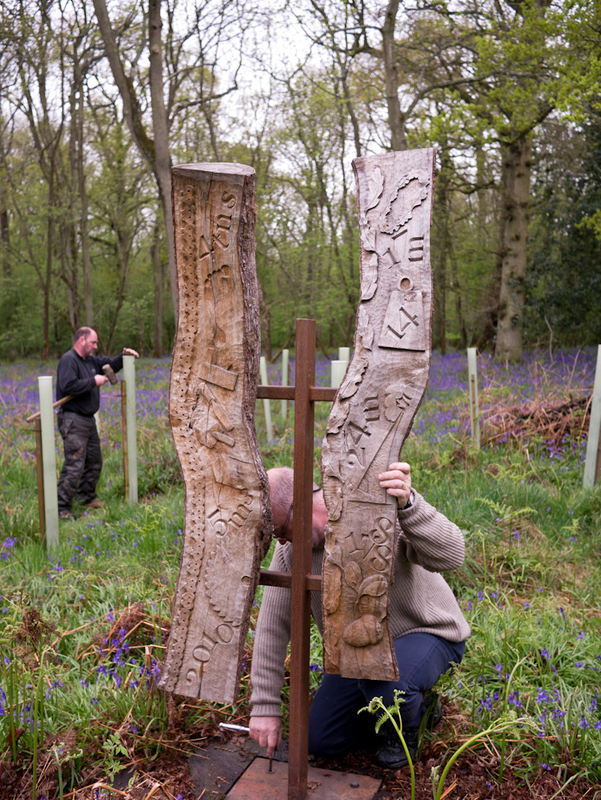 We unveiled a stunning sculpture by Simon Clements, sang tree planting ‘shanties’ written by musician Sarah Morgan, and planted trees with the support of Nicholson Nurseries. The sculpture was unveiled by His Grace the Duke of Marlborough today, and into the future the new forest will be tended by his expert foresters. 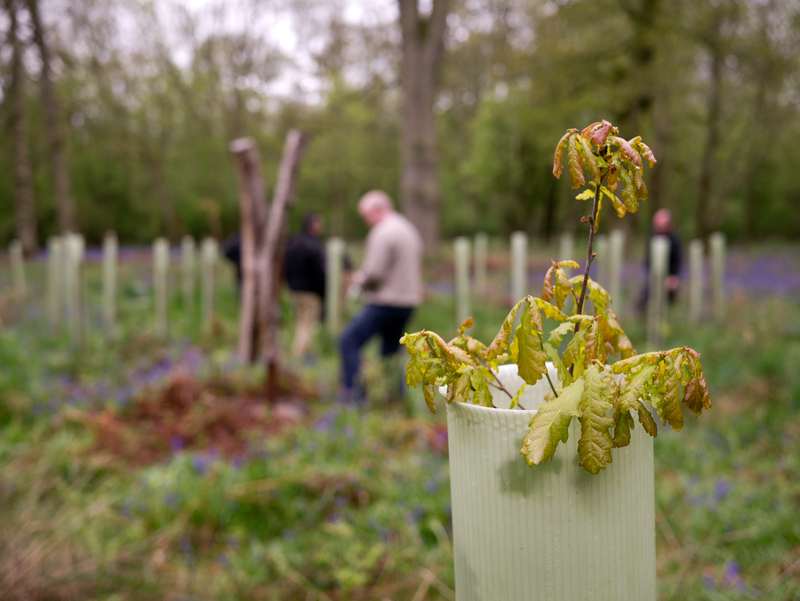 Forty school children came today, five representing each of the classes, while their classmates will all be coming to the site over coming days to plant their own trees: reaching a total of 250 new oak trees by the end of the week.